It was a deserved victory for Sound Works at Canterbury on Wednesday, the lightly raced and promising filly making up for a luckless run at the same track the week previously. Catching the eye with a strong late finish after being held up for nearly all of the straight on that occasion, Sound Works was a warmly supported favourite and this time she was always in clear running. Settling back as usual for Christian Reith, the attractive bay wanted to over-race for a fair bit of the 1100m contest but, after hooking out widest into the straight she was quickly into gear. Hitting the lead with 120m to go, Sound Works was impressive drawing clear to salute by 2 1/2 lengths with plenty in hand. "She really only had a barrier trial last week," said Ballymore's Sydney representative Robbie Hewetson, "but she put her hand up today." "She is a very nice filly, a great type, very strong. She is a darling around the stables but she just gets a bit keen when you ride her." 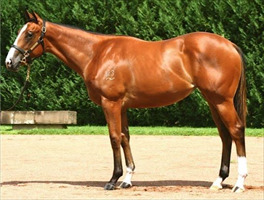 Considered to be stakes class by the stable, Sound Works may head towards the Queensland carnival. Jockey Christian Reith had originally hoped to be more forward on the filly but she had other thoughts... "she just doesn't jump and muster speed," he said. "But she was able to get into a good rhythm today and she was always travelling well." "And I think once she gets onto a bigger track you will see even better acceleration from her." Her dam is the imported Mark Of Esteem mare Abu Zayan, a half-sister to the French Gr.3 winner Alloway. Served last spring by Bullet Train having produced a filly by that 3/4 brother to Frankel in late September, she is a granddaughter of the 1000 Guineas heroine Fairy Footsteps.